The School of Medium Arts and Predictive Science is a professional and social outlet for higher learning enthusiasts. We promote the ancient tools of prediction for personal and spiritual growth through hands-on instruction, practice and guided study. The School also provides spiritual guidance in personal and private sessions. For those seeking more immediate understanding of the situations they areexperiencing in their lives. The School offers an exploration into history, mythology and theology to reach and teach students and lecture attendees. Classes and workshops cover histories and use of Ancient Predictive Tools ranging from; Tarot used by Turkish slaves, Runes from our Northern Cultures, Idling of China and much more. Bringing students personal gratification and enlightenment. A complete list of our courses can be found on our web site. Tracey has over 30 years of experience combined with an extensive background in theology, mythology and religious history. As a result Tracey's pursuits developed into the interesting and growing field of Predictive Science. Tracey's studies help her to understand the problems and evolutionary personal growth situations of the people she counsels. Her depth of knowledge has enabled Tracey to touch the lives of countless people locally and nationally. I am absolutely convinced whatever your religion, whatever your Faith…after reading this book, your knowledge will deepen and your understanding of your life and it’s choices will be heightened, your horizons broadened. 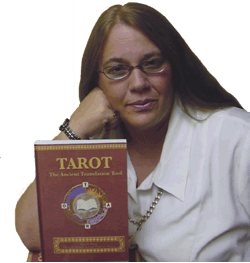 This book is based on biblical lore in conjunction with Tarot. For centuries people have used the bible stories as a basis for our moral standards-life’s lessons- laws and societal guide lines for humanity as a whole. Tarot on an individual level is used for exactly the same purpose — to keep behaviors in check, to adopt appropriate attitudes, also to keep life’s lessons understandable and copable. To combine the bible with Tarot was basic and essential. During my years of study and research one of my personal and professional goals has become to help the world, at large, understand that God and Tarot belong “together” in the same sentence. The Source, The Spirit, Higher Intelligence, or other currently/ commonly used synonyms. Because; “God” is the most ancient and universally understood term for a higher power.